Use of technology in the world of sports is improving at a rapid rate. New types of data, coupled with advanced engineering tools, allow for more in-depth analysis of the human body as it pertains to specific movements and tasks. As a result, motions can be refined and equipment improved to help athletes maximise their abilities and performance. John McPhee, a professor of Systems Design Engineering at the University of Waterloo (UW), has overseen several studies on the motor function of Paralympic athletes. McPhee, who focuses on modelling the interactions between athletes and their equipment to maximize athletic performance. 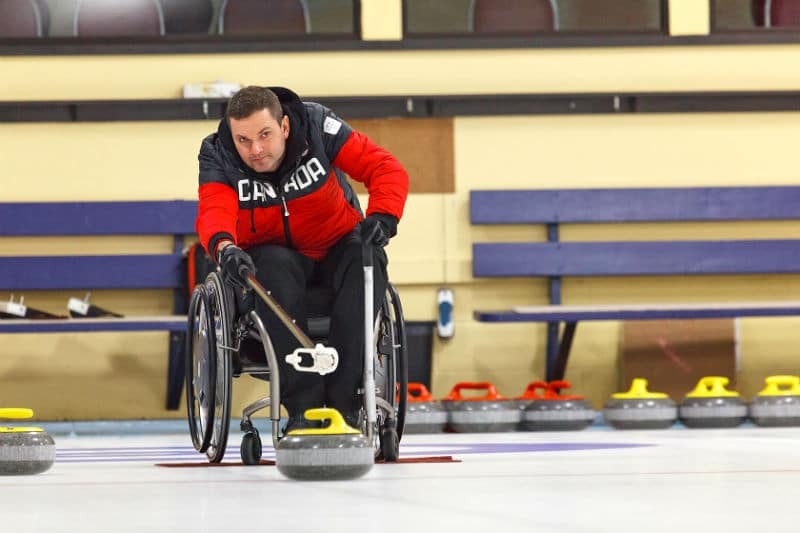 McPhee and his team recently worked with the Canadian Paralympic wheelchair curling team to design a better wheelchair curling shot. McPhee’s team, led by Brock Laschowski, a PhD student in the Department of Systems Design Engineering at UW, conducted a study of the motor control of Paralympic wheelchair athletes, using MapleSim to model their wheelchair curling shot. Laschowski’s research is paving the way for custom-designed wheelchairs designed specifically for individual athletes and their respective neuro-musculoskeletal systems. The study also gave rise to the idea of a curling end-effector, a device to help wheelchair curlers improve control over their shots. The device attaches to the end of the curler’s stick and provides greater command over the stone by pulling it back prior to release. Two more members of McPhee’s team, UW students Borna Ghannadi and Conor Jansen, began the end-effector project in 2016 at the request of Mark Ideson, the skip for the Canadian men’s Paralympic curling team. After being modelled in MapleSim, an initial prototype was built, which has undergone several trials and adjustments since. The device is now on its 7th iteration and is close to being a finished product. We’ve been working with Team Canada for a few years now, and it was extremely satisfying to see them win the bronze medal at the Paralympic Games in South Korea. Currently, wheelchair curlers use a device that keeps the stone static before it is thrown. Having the ability to pull back on the stone and break the friction prior to release will provide great benefit to the curlers. Certain conditions in curling, such as warm or sticky ice, or a freshly sanded stone, can cause the stone to catch or wobble on release, which leads to decreased accuracy. The Mark 7 enables the shooter to slightly pull back on the stone at the release point, thus breaking the inertia. The objective was to design a mechanism that not only allowed curlers to pull back on the stone, but also had a release option with no triggers on the curler’s hand. The Mark 7 device screws on to the end of the curler’s stick, and is designed to rest firmly on the curling handle. It can be tightened or loosened as required to fit the handle properly and provide curlers with greater control over the stone. Once the curler selects their shot, they can position the stone accordingly, slide the stone forward and pull back at the release point to separate the device from the stone. It should help improve the level of curling across the world. Mark 7 could have significant ramifications in the curling world. Shooting accuracy across wheelchair curling is currently around 60-62%, according to Ideson. If the curling association allows the use of new technology, like the Mark 7, that number could grow to 70 or 75%. McPhee and his team have a strong history of improving technology driven enhancements to sports projects. They are currently working with Team Canada wheelchair basketball to model the wheelchair push, which will allow them to test various wheelchair configurations and determine which designs best optimize performance and speed. They have also worked with Cleveland Golf/Srixon to model a driver to better understand the effect of different club lengths and weights on performance, and with Hockey Robotics to develop SlapShot XT, a robot designed to test hockey sticks to improve performance and eliminate breakage.